The World of Althéa: ... And Time Again! You may recall in this post, I said this about Game Time Keeping, "In most NWN modules (my own included), time is scaled in such a way to allow it to pass quicker than in real life. For example, in 'Better The Demon', 1 minute real time equates to 4 minutes game time. However, this is not the case where combat or certain spells are involved, which can be confusing if not recognised." Now, after giving this some more thought, I decided to come up with a system to help the player understand what is going on with respect to those spells that cause this anomaly with time due to their duration. This still requires some concentration to grasp, but I hope this helps. To begin with, I decided I wanted an easy way to give the player information about the spell effects that their PCs had on them. Perhaps it's just me, but I always find it frustrating not knowing exactly what spells are still active (by name) and just how much longer a spell has to last. So, to this end, I made a "Spell Effect" GUI that presents itself to a PC when targeted with a spell. It looks like a scroll that simply lists all the spell effects that are currently on the PC in question. (See screenshot below.) However, this GUI also gives further information about the duration of the spells in question. This information is presented in two formats: For short (rounds) or long (hours) duration spells I use a black font and show the time the spells have been active; and for the intermediary spells (lasting minutes), I use a yellow font and show their time remaining. It is these intermediary duration spells that cause us the problem with time and which I will now refer to as Time Warped Spells. Let me first explain a little more about the GUI layout in the screenshot above. For ease of use (and coding), I decided to show spells that last only a few rounds or those that last for hours per caster level in a black font and how long they have currently been active. This is because for these duration spells the time element can usually be ignored. Why? Because spells that last only a few rounds (or a few minutes at best) are normally cast for the immediate effect and current situation only, and will quickly expire and drop from the list; and spells lasting hours really need only say how long they have been active in a number of hours without a need for so much accuracy. Also note, in both these situations, the existing spell code works fine with respect to time within Better The Demon, because by definition a) No short duration spell lasts longer than a game hour (15 minutes) and b) The HoursToSeconds function used in spells lasting hours already translates the time to work within the module's adjusted time frame. It is true that short duration spells could be argued to last four times longer (using Better The Demon settings) than they say due to this time shifting but, when actually playing the game, this will not be noticed, as the player's mind will interpret short duration spells as immediate timed spells. 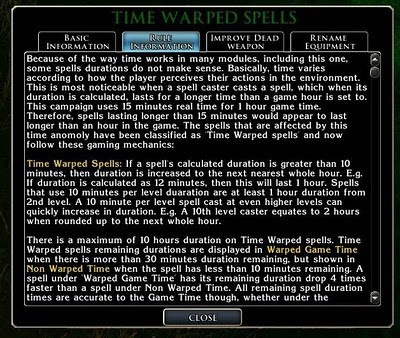 NB: There is a problem with short duration spells if a module's time settings are set to a much lower setting (which I think they are by default), as this would then mean that spells lasting a couple of minutes could, potentially, appear to last an hour of game time. Thankfully, with the time setting used in Better The Demon, the number of spells than fall into the "Time Warp" category are minimised, and with the system I am about to explain, are properly managed. The 30 Min Rule: To begin with, take a look at the first screenshot again, and note the remaining durations for each spell. We are only interested in the Time Warped spells now, so ignore the spells in black (apart from Resistance, which I will touch on in a minute). You will notice that prior to taking the journey along the North West Road that Threska had the following remaining spell durations: Aid 56 min; Resist Energy 60 min and Blindsight 56 min. Now, however, after taking a journey lasting approximately 30 minutes, Aid and Blindsight have dropped to only 7 minutes remaining, while Resist Energy remains at a higher value of 32 min. 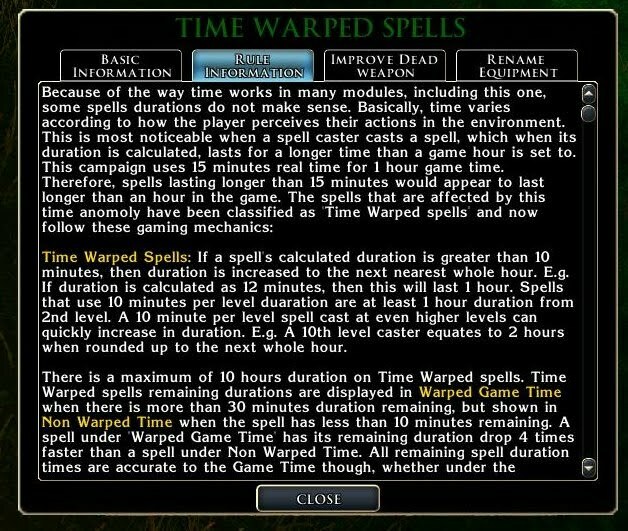 This is because when Time Warped spells have more than 30 minutes remaining, time is deducted in 4 minute chunks (for every 1 minute real time) to reflect the module's time setting of 15 minutes real time equating to 1 hour game time. However, once they drop below 30 minutes remaining, the GUI updates to reflect Non Warped Time, and time is now only deducted by 1 minute for every minute. a) If the player does not travel any further (and does not jump forward time), then within a few more seconds, the Resist Energy spell (which was cast just a few seconds behind the other two) will "catch up" with the Aid and Blindsight spells as it drops by 4 minutes to what would have been 28 minutes, which now translates to 28/4, which is 7 minutes, to display the same as the other two spells. All three spells now have approximately 7 minutes remaining. If they did travel again (taking 30 minutes), then all spells would be removed as they only had 7 actual minutes remaining. b) If the player quickly turned around and did the same journey back (and jumping time forward by another 30 minutes), all the spells would still end simply because of the time for travelling. The Resist Energy spell might show as less than 1 min remaining upon arrival, but would quickly end after the same amount of time it was cast after the other two had been (within seconds). Short Duration Spells: You will note that Resistance had disappeared from the list after the first travelling. This is because it only lasts a minute and so quickly dropped off as the PC travelled. All short duration spells will only ever show ACTIVE less than 1Hr, and is merely a courtesy comment to show them as active. Long Duration Spells: By contrast, long duration spells will remain on the GUI for as long as the spell duration, and give a rough idea of how long they have already been running. 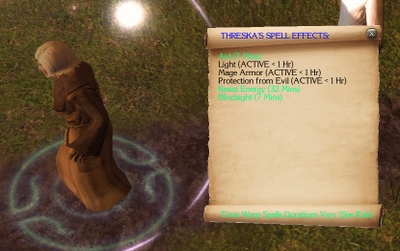 Below are a few snapshots of the GUI showing the spells active and how long they have been running. Note, the Mage Armour spell was cast a few seconds after the other two, and so shows a slightly different time remaining in the middle image. Within a few seconds though (the time difference between the castings), the GUI updates to show the new time, which is similar to the other two spells. The Differences: The bottom line is, the players will not notice the duration differences simply because the game adjusts according to the style of play. For even if a PC stays within the same area for a period of time greater than 15 minutes, an hour game time will pass thus ending any spells that may, at first, appear to be greatly improved by the system. When all the sums are done, it is possible that some spell combinations give slightly longer durations, but on the balance of things, I believe this gives a much more accurate system than the default. Please change the neon green text before release! I can't read that on the parchment at all, only for the aid spell when it's set against a shadow. I did try a few different colours, as this is a little difficult. However, can I ask, did you click on the picture and view the image at full size? It is much easier to read when seen this way. My original comment was from them enlarged. How about a dark orange/brown or just darker green? Or you could use the blue from the "Threska's spell effects" and switch that color to black. The neon green doesn't have enough contrast against the parchment. Anyways, this looks pretty nice. NWN2 has quite a few shortcomings, and this is one of them. It's always nice to know what spells I have on(like, is the spell haste *or* is it battletide, as they both have similar ends effects). I have now changed the colour. ;) The title is now in black, and the Time Warped spells use the blue. Yes, I think this extra information is useful. I wonder if it is just because I played that way with D&D? Did you used to play PnP and track the spells? I am trying to find out if this sort of thing appeals to everybody, or just old timers from the PnP danys.